Cavechat.org • View topic - adjustable spectra/dyneema/HMPE footloop? One can always use a clove hitch(or other suitable knot) to temporarily create a shorter tie in point in their fixed length footloop. This allows a pretty wide range of adjustment for those infeequent times it is needed without having to carry extra gear. This sounds like what are sometimes called Purcell Prusiks, named after the Purcell Mountains in British Columbia. www.canyoneering.us/docs/purcellprusiks.pdf A whoopie sling is based on a splice in single braid rope. The Purcells use Prusik knots. If one Insisted on an adjustable footloop but likes the kiss theory a simple prussik would work or the kong slyde whould be a good option. I like the slyde on my long cowstail. Caver John wrote: If one Insisted on an adjustable footloop but likes the kiss theory a simple prussik would work or the kong slyde whould be a good option. I like the slyde on my long cowstail. Do you have two separate ropes for 2 footloops? If so, I would say consider just tying a double loop knot at the end of one. 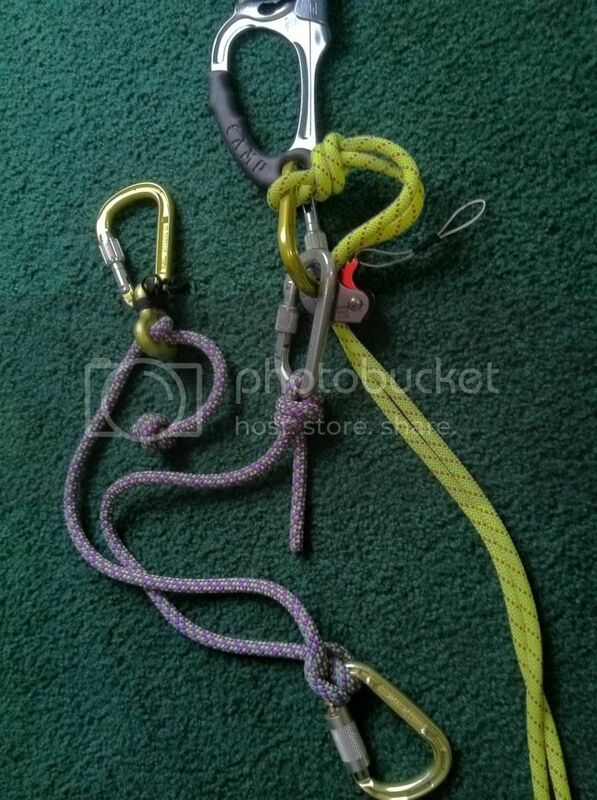 Also, it looks like your footloop rope is as thick or thicker than the cowstail rope. To streamline you could go with something much thinner/lighter such as 5 mil spectra. I do have two footloops. This way I can keep both feet in and still push away from a wall or whatever. I also find it easier to footlock with separate footloops. I've been debating goin with a singe strand with double loops though. The footloop cord is something like 6.4mm static cord and the cowstail is 9mm. Another benefit of using the ropeman on two footloop cords is setting one higher than the other for getting out over lips. Caver John wrote: I do have two footloops. This way I can keep both feet in and still push away from a wall or whatever. I also find it easier to footlock with separate footloops. I do normally use two feet for climbing. Even if I'm only using one footloop, I'll use the left and put my right foot on top of the left, locking the rope in between. This is something I've seen a few times and have been meaning to try for a while myself. Brian Killingbeck from TN, Shane Stacy from AL and Dave McRae from AL all use this approach. I can't imagine it helps with bulk, but it seems like it would definitely save the trouble of switching feet mid-pitch when fending off of a wall, or having to replace your foot in the footloop when reaching a free-hanging section of rope. If you have a West Marine store or similar near you you can probably pick up some Amsteel cordage really cheaply and easily.